Couple of brake discs malossi whoop disc nine. 267 mm - thickness 3.5 mm. The brake disc last generation very light, stainless and dimensionally stable. The whoop disc have been subjected to numerous tests both in competitions and on inaccessible routes in order to allow malossi technicians to develop a series of discs for the most common vehicles. Malossi discs, in combination with the Malossi range of brake pads, are able to guarantee a progressive and safe braking until the complete stop of the vehicle even after hours of use. Malossi reference: 6216320e (old reference malossi: 6213318). Malossi brake pads also available (see our other sales). New, sold in original packaging. In stock - shipping within 24 hours. Mbk evolis 400 ie 4t lc front. Yamaha t max 500 ie 4t lc 2004-> 2007 front. Yamaha t max 530 ie 4t lc 2012-> 2014 (j409e) before. Yamaha t max 530 ie 4t lc 2015-> 2016 (j409e) before. Yamaha t max 530 ie 4t lc euro 4 2017-> (j415e) front. Yamaha t max dx 530 ie 4t lc euro 4 2017-> (j415e) before. Yamaha t max sx 530 ie 4t lc euro 4 2017-> (j415e) front. Yamaha x max 400 ie 4t lc euro 3 -> 2016 (h330e) before. Yamaha x max 400 ie 4t lc euro 4 2017->. Stainless steel disc, laser machining, enhanced and rectified. Defined profile calculated to fully utilize the area of ​​the braking material, discharge dust, evacuate water and sludge during braking. The area of ​​heat dissipation is when doubled to keep low the operating temperature. 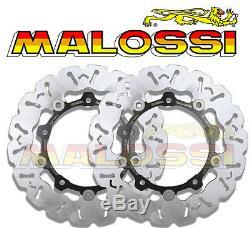 The item "front brake discs malossi yamaha x-max 400 t-max 500 tmax 530 new 6216320e" is for sale since Monday, July 30, 2012. It is in the category "auto, motorcycle parts, accessories \ motorcycle \ spare parts \ brakes, suspension \ brake discs ".